El Molón Archaeological Park is a major undertaking, with repercussions for the economic and social development of Camporrobles as well as for the cultural heritage of the Region of Valencia. As well as providing the chance to visit this important part of the local cultural heritage, it also helps to protect the environment, preserve the site and ensure it can be enjoyed, and strengthens the sociocultural aspect of El Molón. There is growing interest in archaeology as a cultural asset, with people wishing to visit and appreciate the ruins as they are, learn about how such sites are studied and evaluated, understand the difference between conservation and completion, and be able to equate what a ground plan shows to the actual architectural remains. El Molón is at the top of a large hill formed in the Cretaceous period, at an elevation of 1,124 metres. 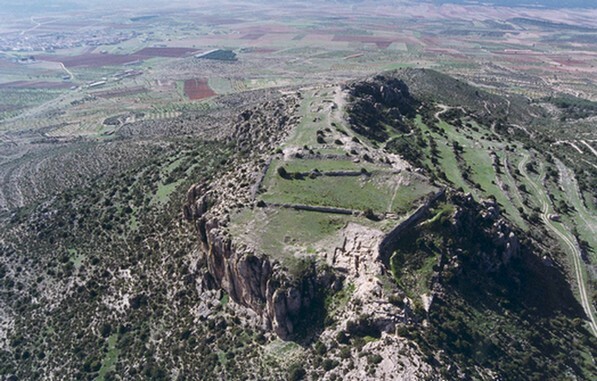 It is an elongated site on various levels, the middle one forming a plateau that was chosen by settlements throughout the ages for its excellent defences, as it is surrounded by sheer drops on almost all sides. Some of the features at El Molón are practically unique, including the surrounding landscape and the archaeological site itself, which has been relatively well preserved and includes the pre-Roman defensive system, one of the great examples of an Iberian fortification, and the medieval settlement, with streets, more defences and a mosque. Visitors to El Molón Archaeological Park learn about the geography of the site, the pre-Roman defences and stone cisterns, and the buildings erected in the medieval era, including the mosque. The site forms part of the landscape between the low hill ranges of Cuenca and Requena-Utiel, with a three-hectare plant micro-reserve, a superb juniper forest on the shaded side of the hill, and a varied birdlife. The Interpretation Centre contains plenty of scientific information and includes a presentation to help you learn about and enjoy the archaeological remains that can be seen. Computer graphics: Manolo Solre & Dosign Comunicación Global S.L.